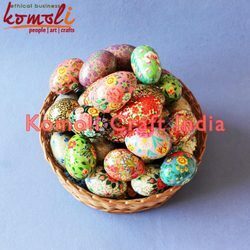 Leading Exporter of hand painted easter decorative wooden eggs, hand painted paper mache easter egg custom sized easter egg, whole sale paper mache easter egg custom designed easter e, custom designed easter eggs latest designs of easter eggs, custom painted easter eggs - 2015 wholesale easter eggs and paper mache easter egg custom sized easter egg from Hyderabad. 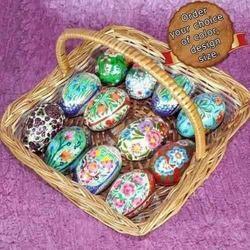 Wooden Or Paper Mache Easter Eggs of sizes starting from 1 inch and upward. Beautifully Hand Painted, Eco-friendly, colorful unique Easter Eggs. We have wide range of designs existing available, additionally we would be looking forward to hear about your customised painting requirement. Along with these beautiful easter eggs we do provide Egg shaped box that can also be used for Festival Decoration as well as Gifting Purpose. 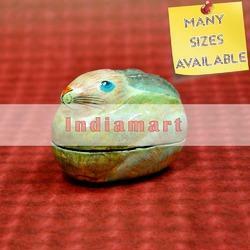 We can also arrange to pack them in to specially designed gifting box, bags for it. Please feel free to get in touch with us for your custom designed Easter Egg's requirement, the size painting patterns are allways customizable depending up on the requirement of yours. Packaging Details: Each egg in polybag and master packing. Custom packing as required. 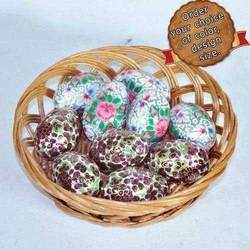 Our company is a renowned manufacturer, trader and supplier of the best quality Hand Painted Paper Mache Easter Egg Custom Sized Easteregg. 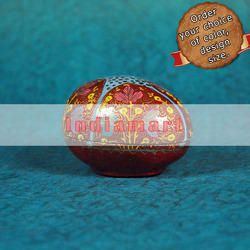 Our offered easter egg is design with attractive colors. 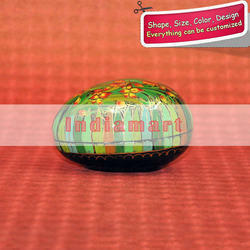 This easter egg is used for festival decoration as well as gifting purpose. In addition, we are benefiting our customers by providing this easter egg in customized designing & coloring options. Keeping track with market development, we are engaged in offering Whole Sale Paper Mache Easter Egg - Custom Designed Easter. 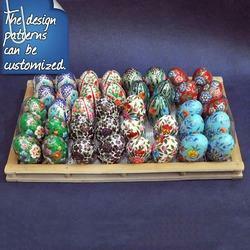 These easter eggs are designed with attractive colors in various designs on it. 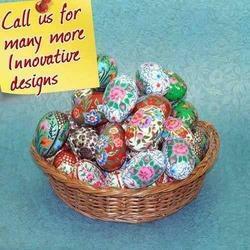 We offer our easter eggs in varied sizes as per the need of customers. Our easter eggs are arranged to pack them in to specially design gifting box. 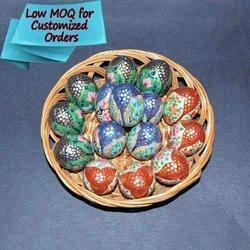 Wooden Or Paper Mache Easter Eggs of sizes starting from 1 inch and upward. 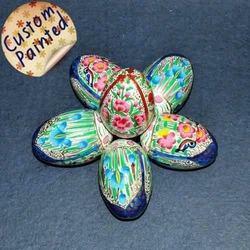 Beautifully Hand Painted, Eco-friendly, colorful & unique Easter Eggs. We have wide range of designs existing & available, additionally we would be looking forward to hear about your customised painting requirement. Along with these beautiful easter eggs we do provide Egg shaped box that can also be used for Festival Decoration as well as Gifting Purpose. We can also arrange to pack them in to specially designed gifting box, bags for it. Please feel free to get in touch with us for your custom designed Easter Egg's requirement, the size & painting patterns are allways customizable depending up on the requirement of yours. Packaging Details: Each Egg in Polybag - Bulk Commercial Packing Custom Packing available as per requirement. 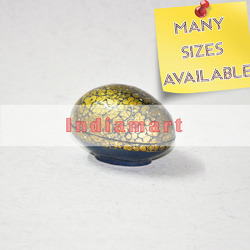 Wooden Or Paper Mache Easter Eggs of sizes starting from 1 inch and upward. 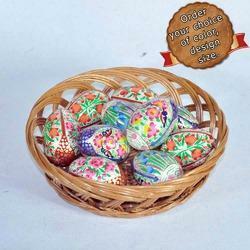 Beautifully Hand Painted, Eco-friendly, colorful & unique Easter Eggs. We have wide range of designs existing & available, additionally we would be looking forward to hear about your customized painting requirement. 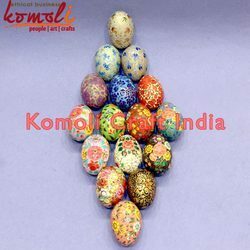 Along with these beautiful easter eggs we do provide Egg shaped box that can also be used for Festival Decoration as well as Gifting Purpose. We can also arrange to pack them in to specially designed gifting box, bags for it. Please feel free to get in touch with us for your custom designed Easter Egg's requirement, the size & painting patterns are always customization depending up on the requirement of yours. 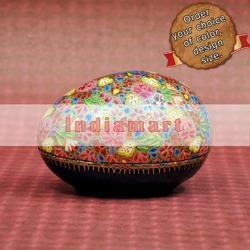 Beautiful Indian Handmade Easter Egg, Handpainted with Perfection. 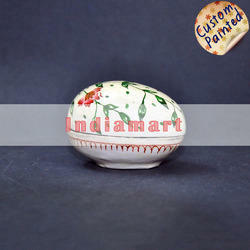 This can be customized as per your painting pattern requirement and color combination. 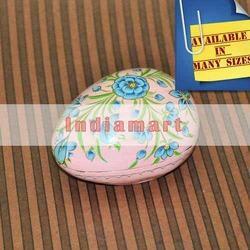 Handpainted Easter Egg Boxes, Paper Mache Egg Boxes, Easter Eggs, Paper Mache Boxes, Paper Mache Packing Boxes. 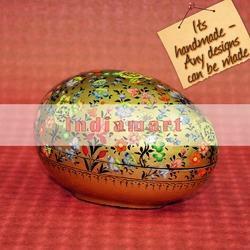 Beautiful Indian Handmade Paper Mache Box, Handpainted with Perfection. This can be customized as per your painting pattern requirement and color combination. Crafting Process Paper Pulp Moulding & Hand Painting. 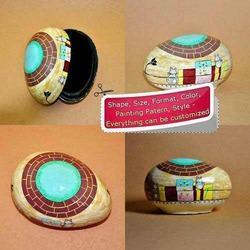 Craft Form Paper Mache & Painting. Crafting Process Paper Pulp Molding & Hand Painted. Crafting Process: Paper Pulp Moulding & Hand Painted. Paper Pulp Moulding & Hand Painted. Looking for Easter Eggs ?